By a gentle babbling brook and only a short stroll to the beach, this is an amazing detached 3 bedroom family home that will take your breath away. Built and finished to a high standard, this stunning home has the substance to support the style, it has been beautifully constructed on a fabulous site with a slow flowing stream on the back boundary. The sound from the stream and birds singing in this wooded setting makes this place something special. What you don’t appreciate from the road is how the owner has used the setting and existing resources to create a paradise among the palms. The addition of the conservatory has added another dimension, it brings the outside in in less favourable weather, which makes this a magnificent lifestyle opportunity. 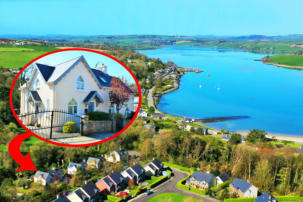 Along with being spectacular the setting is also convenient being within walking distance of the village, 15km to Clonakilty, 18km to Bandon and only 45km from Cork airport. Services: Mains water, mains sewage, oil fired central heating and broadband is available.